The saying goes that cash is king. While that's true, a more accurate saying when it comes to finances is that cash FLOW is king. Whether you're retired, still working or just starting out the only way you can improve your financial house is to have positive cash flow. If you're in the accumulation phase then that positive cash flow allows you to save and invest to build up your future cash flow. If you're already retired, or FIREd, then congratulations because I'm sure your cash flow is well above what you need. We've been fairly lax in regards to our budgeting, but the time is right to really get things moving forward. One of our big goals for 2018 is to focus on our monthly spending. When it comes to personal finance it's rather simple: income - expenses = savings and savings x investing = financial independence. There's obviously two main levers there and while we'd all like to increase our income, many times reducing expenses is some of the low hanging fruit that you can go after to increase your savings. Total income for December came in at $10,771.60 which was a solid end to 2018. The majority of that income, $5,789.06, came from my day job. Passive income, dividends and interest, added another $1,062.41 with other income totaling $3,920.13. Other income was comprised of the check from my insurance for my totaled vehicle. Expenses shot way up during December due to the down payment for the purchase of my car. Excluding the down payment total expenses came in at $3,785.86 for December. That's still above average for me although that does include a lot of discretionary spending for Christmas gifts. Excluding the cost of the gifts brings the monthly spending back in line with the norm for 2018. 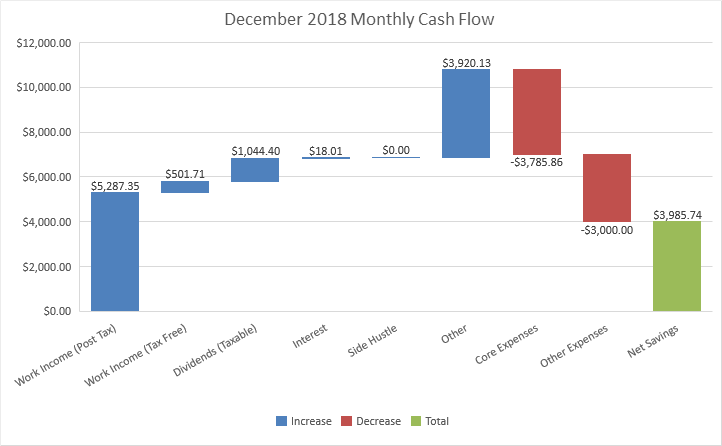 December ended up having a net positive cash flow of $3,985.74. Excluding the down payment for my vehicle and the insurance check I ended up with a positive $3,065.61 cash flow for the month. The official savings rate for December was 37% based off all income sources and -17% based solely off of work income, i.e. excluding dividends, interest, side hustle and other. *A few notes about the cash flow check in. All income is only income that I receive and does not include my wife's income likewise for the expenses. We've found it's easiest for us to just keep separate accounts since I'm gone most of the time for work. Also, pre-tax withholding for the 401k (I currently withhold 6% in order to get the full 5% employer match) and the ESPP through my employer (8% post tax withholding) are not included in the above savings amount. Each month I like to examine the state of our non-work cash flow. Since our goal is to become financially independent the monthly cash flow has to come from somewhere in order to cover our expenses. Non-work income (dividends,interest and side hustle), totaled $1,062.41 during December which was about a $14 increase from September. *Dividends are from my taxable accounts only. Based on December's spending the passive income for the month covered 16% of expenses. Passive income covered 28% of my core expenses. Throughout 2018 I received a total of $6,432.46 from dividends and interest, what I consider truly passive income, and another $592.41 from my side hustle. All told that's an additional $7,024.87 from income outside a traditional day job. This multi-year stretch of constant change is frustrating and really getting to me mentally. It seems like every time we start to build momentum something else comes along to make us change our plans. In 2018 the biggest factors contributing to that was (1) our family vacation to Grand Cayman (no complaints from me about that one since we paid for the vacation in cash), (2) my wife getting pregnant (no complaints about that one either because well, we were trying), and (3) the unexpected car accident and subsequent purchase of a vehicle (ugh!). Such is life?!?! Since 2018 didn't bring about as much progress as was planned regarding debt reduction that's going to be the key focus at least until my wife's vehicle is paid off. Make sure you sign up to receive new posts to your email so you don't miss anything. And be sure to follow me on Twitter @JC_PIP to get up to the minute news of purchases for my portfolio or if you prefer Pinterest or Facebook I'm on there too. 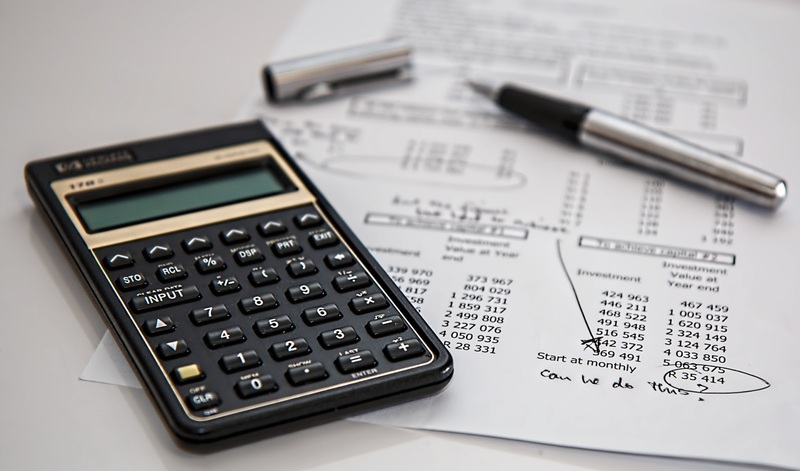 Has your monthly cash flow situation improved throughout the year, backtracked or held steady? Colgate-Palmolive: Buy, Sell Or Hold?